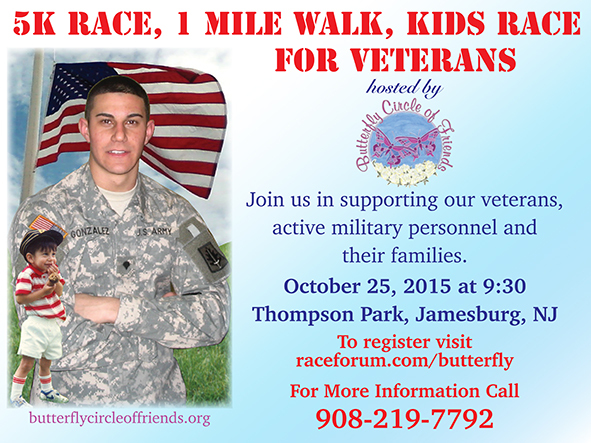 We are looking forward to this years 5k Race, 1 Mile Walk and Kids Race on October 25, 2015. Each year we try to make it bigger and better and this year we did just that. Not only do we depend on the runners and walkers, the corporate and business sponsorship's makes up for most of our fund-raising totals. This event would not be possible without these sponsors. If you would like to make a donation or have a company and want to sponsor this event to help us off-set the cost you can click here. We've been donating the funds we raise to non-profits that already have fantastic programs in place to help veterans and active military with PTSD. Vets Chat & Chew is one and Spring Reins of Life is another just to name a couple. We have also created the Spc Michael L Gonzalez scholarship for veterans at Middlesex County College. Without your participation none of this would be possible. Below are some of the pictures from our 2014 5k Race, one mile walk, and kids race.